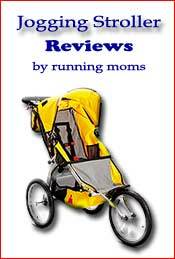 Bob Revolution Stroller reviewed. Anna has completed two marathons, one ultra and many shorter races. She used her Bob revolution stroller for all her runs while training for her second marathon. She started out pushing her baby in it when he was about two months old and she and her baby still enjoy runs with it at 4 years old. This is the top of the line jogging stroller if your criteria is solely something that will be great for doing a lot of running with one kid. My Bob Revolution stroller has slowly grown on me over the months. I started out using it when my baby was just two months old. They recommend in the manual that you wait 'till your baby is eight months old, but my baby was just fine. He is a pretty big kid...people usually guess he's about two months older than his actual age...and he could hold his head up. I'm also a slow runner and ran mostly on pavement. I never even got the infant seat accessory, I just put him right in the stroller and he loved it. In the beginning, he usually went right to sleep. Now that he's two years old, he sometimes dozes off and then wakes up again and just enjoys the ride. As far as pushing it, this is the easiest stroller you will ever push. I've become so used to it, I think I run better with it than without it. It has great shocks so it is very comfortable for him and big wheels so it can be pushed in any terrain. The front wheel swivels or locks in place. I usually choose the swivel option, because when I lock it, it veers to the right just a little, but it makes it very tough to run like this. He can recline or sit up straight. The sunshade also covers him very well, but I still got the rain cover for added protection when we get caught in a rain storm. 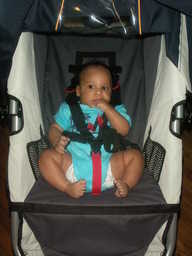 Here's a picture of my son looking very comfortable in the jogging stroller at three-months-old. There are only three downsides to this stroller. It doesn't come with any accessories whatsoever, not even a cup holder. They all have to be purchased at extra cost. There's only a small compartment space in the bottom which can barely fit a diaper bag. But then again if your jogging with it, the less added weight you have to carry the better. And it doesn't collapse. You can only fold down the top, but since the NYC buses require that you collapse your stroller before getting on, it makes it impossible to ride the bus. However, we can easily take the wheels on and off in order to put it in the trunk of our station-wagon. If you are choosing a jogging stroller just to get around, this is not the stroller for you. But if you are choosing a jogging stroller that you plan on using to clock in lots of miles or train for a marathon, the Bob Revolution stroller is the stroller for you. Interested in purchasing this stroller? Click here to check Amazon.com's current price for this stroller.